I am a Long Islander. I have sailed Long Island Sound since childhood and cruise extensively in this “Mediterranean of the East,” so when I got word of a 42-foot production catamaran being built in my backyard, I was truly intrigued. something that many in the multihull industry thought was impossible. 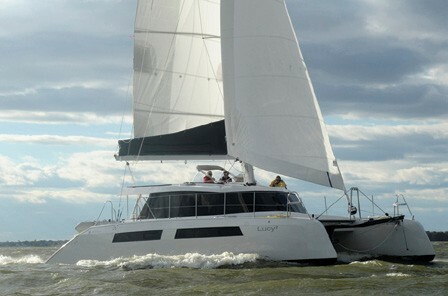 Without outside funding or assistance, they have launched a quality cruising catamaran only an hour from New York City. 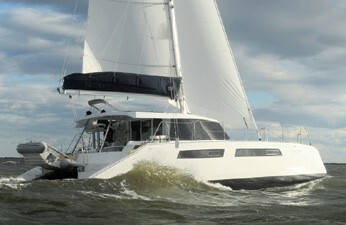 Alpha Yachts, located at South Shore Boatyard in Patchogue, NY, has built two Alpha 42s and has orders for 10. “If Wally Yachts was to design a 42-foot cruising cat, this would be it,” said Tarjan. Indeed, when I set eyes on the Alpha 42 I was struck by its good looks. Most cruising cats, especially those under 42 feet, suffer from lumpy proportions, exaggerated hull heights and low bridgedeck clearances. The Alpha 42, however, is a purposeful looking yacht with enough aggression in her chiseled lines to satisfy the most demanding go-fast sailor yet there are enough soft breaks and a stunning interior to soothe the minds of our lady partners. All shapes are easy to understand and one’s eye has an easy task of following the flow of angles and lines. Tarjan aims to completely re-interpret the modern cruising catamaran, and I believe he has made great strides to that end. “Gregor’s hulls were the hardest ones I ever had to build and I have built more than 850 boats in 35 years,” said Anassis, who is a naval architect and engineer. Each hull has two chines that accentuate the boat’s silhouette and aggressive reverse bows. The key to Alpha Yachts’ success, Anassis explained, is their workforce, most of them professional boat builders. As we walked through the various shops and assembly buildings, he proudly explained each build process in detail. I could see the advantages of laying up a hull in a more traditional way, rather than an automated production process such as infusion. The penalty, he explained, is about 3-5% more structural weight, but the chance of delamination is completely eliminated. Alpha Yachts’ choice of resin is not Polyester but the much stronger Vinylester. Not a single piece of balsa is used in the hulls or decks. The hulls’ core material is Nomex honeycomb, and the decks have 1-inch thick Nydacore. Anassis says the Alpha 42 is the strongest boat he has ever built. This structural strength was proven when hull #1 survived a force 10 winter storm last January. The boat was slammed by a 40-foot rogue wave that pushed it backwards, submerging nearly half of the rear decks. The official insurance report states that the rudders were thus damaged and the boat was abandoned, but the Alpha was fully intact. Approaching the Alpha, which was tied to the dock like an eager racehorse, I admired its lines and impeccable gelcoat, although one unanswered question was troubling me: How can a 42-foot catamaran whose beam is just over 24 feet have enough bridgedeck clearance to deal with pounding seas? Anticipating the inquiry, Tarjan produced a tape measure. “Thirty-eight inches, just shy of one meter,” he called out, asserting that this is by far the highest bridgedeck of any catamaran this size. This tunnel height will go a long way to ensuring comfort in a seaway. Stepping aboard, I was greeted by the warm color of the synthetic teak decking. “It has zero maintenance,” said Tarjan. “It looks like real wood and has an added advantage that you do not have to wash the decks so often.” Entering the cockpit, I had to remind myself that this cat is only 42 feet long. The immense beam gives a sense of space of a much larger multihull. A generous U-shaped cockpit seating area has a folding teak table that can be exchanged for the saloon table and lowered to make a coffee table. 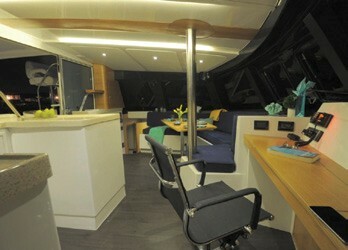 To port, behind the massive stainless double helm seat, is a large lounge area. Tarjan is working on an optional “wet bar/barbecue” module for this area, which would be ideal for charter guests. Very large cockpit drains, hidden under a beautifully crafted teak grate, will assure swift evacuation in the rare case of waves entering the cockpit. The entire aft side of the cockpit is spanned by a 22-foot by 30-inch veranda that connects the hulls, so that guests can cross between hulls without disturbing people in the cockpit. This area can also be used for water toy storage or sunbathing. Stepping onto the main deck, I walked forward unencumbered by any obstructions. The hatches are flush, and the continuous handhold on the overhanging coachroof “eyebrow” gave me a sense of security. I noted an integrated water catchment system on the saloon roof, which is offered as an option. Forward is a clever trampoline seating area with enough room for two people to sleep under the stars. Steps lead up to the mast, where I observed the very thoughtfully laid out sail handling systems. Lately it seems to be fashionable to ruin a catamaran esthetic with the addition of helm station biminis – horrible-looking contraptions that some sailors nevertheless cannot do without. For these folks, Tarjan designed a forward-folding dodger/bimini that can be deployed in seconds or folded forward. Most of the cockpit is covered by a fixed composite roof. 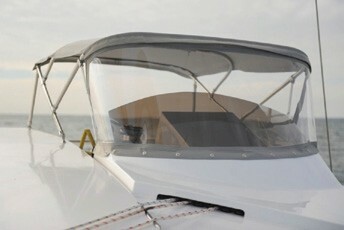 For hotter climates, an optional “roof extension pack” shades the entire cockpit and can be enclosed with side curtains. I have sailed on many catamarans and inspected the newest models at boat shows, and cannot recall having such good visibility from the saloon in every direction, whether sitting or standing. The main deck is one of the highlights of the Alpha 42. Two sliding doors open to the main deck, creating a sizeable inside/outside living space. Part of the galley, which is to starboard, is exposed to the cockpit, effectively becoming a bar. Guests in the cockpit will have unobstructed communications with those in the saloon. A large navigation station means business. The expansive instrument panel has a black carbon-look covering and more space for a suite of electronics than most boats I have seen. An optional joystick or autopilot control transforms this command center into a true all-weather, forward-facing helm station. The electrical panel is just as impressive, with 45 breakers. The boat has the optional courtesy lighting. Dimmable strip lights and small courtesy lights are strategically placed on the transom steps, cockpit and interior. The starboard hull is the owner’s suite. A queen-size double berth (with side access) is flanked by beautifully finished oak veneered cabinetwork. A long, backlit storage compartment is perfectly placed along the length of the bed – a modern interpretation of a night table. Midships, a curved lounge and small desk sits opposite a wall of built-in lockers. Cleverly hidden behind the sliding companionway door is the escape hatch and a seat, under which the clothes hamper finds the perfect spot. This could also be the space for a washing machine, Tarjan explained. All the way forward is the owner’s bathroom. This is the first boat I have seen where the actual head is hidden from view. It’s cloaked by a white composite cover that hinges out of the way when the head is in use. When closed, it makes a perfect seat – why is no one else doing this? There is ample space to shower, even for tall people like me. The head compartment is lined with natural teak, while the rest of the interior has a fine oak veneer. 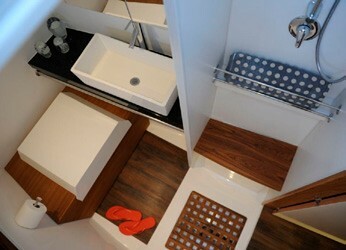 The port hull has a spacious head with separate shower midships. Aft is a large guest stateroom with a side access queen-size bed flanked by a seat, two drawers and several lockers. Forward is another guest cabin with two lockers, a large sliding drawer under the bed, and opening hatches. The view from the hulls is spectacular. There are two opening portlights in each hull that will assure good ventilation when not using the air conditioner. Forward of the hull interior are two giant sail lockers. On this particular boat, the port sail locker has a full-length workbench. In the charter version of this boat, these would make great skipper and crew quarters. windscreen. This feature will block out glare and UV damage to instruments, and will be immensely useful when beating into a cold Atlantic gale. As we unfurled the genoa in light air the boat picked up to an easy 7-8 knots, and I immediately noticed a different motion compared to conventional-hulled catamarans I have sailed. The stylishly raked wave piercing bows cut through the water with the softest of motions. Tarjan asked the photo boat (a heavy displacement 42-foot poweryacht) to cross our bows several times at high speed. The Alpha handled the resulting three-foot waves with ease, punching through them with a solid, controlled motion. I concluded that the Alpha 42 feels a bit more like a trimaran than a cat. Her motion is slower and less jerky, which should be very welcome in heavy seas, especially to those with a weak stomach. Then it was time for the turbo. Tarjan hoisted the 1,100 square foot gennaker with the electric winch, the sail snapped open and boatspeed hit a constant 9 knots in 15-17 knots of wind. This beautifully cut sail is made of 1.5 oz. nylon and rolls on an endless line Facnor furler from the carbon bowsprit. As the wind picked up to over 20 knots we bore off, unfurled the self-tacking Solent again and stowed the gennaker. Tacking is a breeze and the Alpha 42, at nearly 10 tons fully loaded, can be handled like a dinghy. With a determined turn of the wheel, it tacks easily with no need for backwinding, changing of sheets on winches, or starting the engines (as on some other cats). It started to rain on the way back in, and I welcomed the helm station dodger/bimini and the clever windscreen. This boat has top-notch equipment including Yanmar engines, Selden mast, and Lewmar and Harken deck gear, and its innovative features make it very special. The Alpha 42 is built with the attention to detail of much more expensive custom yachts and has features normally only found in larger catamarans. 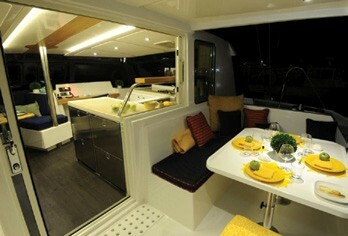 Charter companies will love the oversize cockpit and deck area and the spacious saloon. Private owners will appreciate the quality fit and finish of a boat that is made in America by old world craftsmen. Sailing this boat into any harbor would be special, with its beautiful looks bound to draw attention. The Alpha 42 is a winner, and may redefine how we perceive cruising catamarans. + Quality workmanship, innovative design, made in the USA. – Ill-fitted trampolines, underpowered with standard self-tacking Solent, no grab handles in companionways, limited cabin storage in the 4-stateroom charter version. Will Becchina grew up sailing out of Smithtown and Port Jefferson on Long Island’s north shore, piloting both monohulls and a 30-foot open bridgedeck catamaran. He currently enjoys cruising with his family, chartering in the BVI, and assisting with the Three Village High School sailing team.